The Hot Latin Diet was created by Dr. Manny Alvarez based on his observations that Latin American immigrants were usually slim and healthy when they first arrived in the United States but within several years of a standard American diet they were usually overweight. He designed the diet based on what he ascertained was the foundation of the ability of Latin people to retain their slender physiques in a culture that places a great deal of emphasis on its food. What he discovered was that there were seven important powerfoods that form the basis of this diet. Dr.Alvarez claims that the Hot Latin Diet will reduce hunger by 11% and increase fat burning by 25% and he also states that dieters can lose up to 20 pounds in just 6 weeks. The Latin approach to food and life is one of enjoyment so the emphasis is on increasing variety and flavor in the diet, which is achieved to a large degree by adding lots of spice to meals. It is a reduced carbohydrate program that eliminates simple and refined carbohydrates in favor of those with a lower glycemic index such as legumes, whole grains, fruits and vegetables. Dr.Alvarez advises dieters to eat seafood for the mid-day meal every day based on the results of studies that demonstrate that dieters who eat fish for lunch automatically reduce their dinner portions by 11%. This is not a low fat diet but rather the emphasis is on improving the balance of fats in the diet by emphasizing fish, avocados, olive oil and nuts. Dr.Manny introduces dieters to the seven Latin powerfoods, which provide antioxidants to promote detoxification and improve metabolism. These seven foods will boost the dieter’s vitality while also helping increase the feeling of fullness and satisfaction after meals. Contain more nutrients than regular tomatoes and are a good source of antioxidant vitamins such as vitamin A, C and folic acid. High in fiber to improve elimination and intestinal flora balance. They are also a good source of low glycemic index carbohydrates. Helps to increase the elimination of toxic metals from the body and is also said to possess antibiotic properties. Assists with the regulation of blood glucose and lowers cholesterol. Increase metabolism and reduce appetite. Improves digestion, immunity and has heart protective effects. Appears to block fat and sugar absorption. Boosts immunity and lowers cholesterol. A source of good fats that can improve cholesterol balance. Look for other latin/mexican recipes here. Diet is the emphasis of the book with only general recommendations given for exercise. These exercises can be used with the Hot Latin Diet. 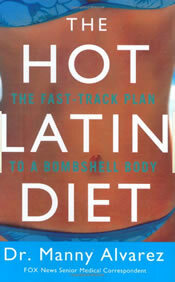 The Hot Latin Diet retails at $23.95. Meals designed by certified nutritionist. Provides recipes that are interesting and flavorful. Promotes the intake of fruit, vegetables and other food components that are associated with health enhancement. High in essential fatty acids and quality protein. May require a dramatic change in the current dietary pattern. Promotes the concept of fast weight loss. Many recipes take a lot of time and effort to create. While the Hot Latin diet does appear to be a very healthy approach to dieting it seems that basing an entirely new dietary structure around the seven powerfoods is unnecessary. It would be much simpler for dieters to experiment with gradually adding these foods into any other diet program that they are already following and likely achieve equal health benefits. The strength of this diet plan appears to be in its potential to offer dieters low calorie meals that are big on flavor and for dieters that appreciate this eating style it could be an effective long term weight loss plan.